BEYOND INSIGHTS is located at Unit 100.6.011 (Level 6 Unit 011), 129 Offices building in Jaya One, 72A Jalan Universiti, Petaling Jaya, Selangor, Malaysia. Jaya One is easy to get to. We are only 15 minutes away from major highways like, LDP, Sprint, Kerinchi, and Federal. It is accessible by public transport and there are ample parking at reasonable rates. Get off at the Asia Jaya LRT station (opposite Menara Axis) and take a taxi or Rapid KL Bus to Jaya One. It is just 10 minutes away. If you’re coming from KL board Rapid KL Bus No. U85. If you’re coming from the Asia Jaya LRT station or Sect. 14 or Sect. 17 board Rapid KL Bus No. T635, T628, & T628B. If you’re coming from Asia Jaya LRT station or Eastin Hotel board Rapid KL Bus No. T629. 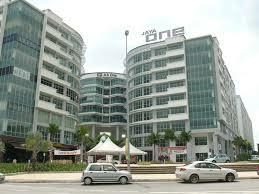 Jaya One is just 30 minutes drive from KL City Centre or Subang Jaya. If you’re taking a taxi, do remind the taxi driver to use the meter. Need a taxi to go home? Just approach the Information Counter at B2, near Guardian for assistance. Or just open Waze on your Smart Phone and search for “Beyond Insights” or “Jaya One”. First 2 hours or part-thereof RM 2.00 Each sub-sequent hour or part-thereof RM 1.50 After 6 pm (Mon-Fri) RM 2.00 per entry Sat, Sun and Public Holidays RM 2.00 per entry. 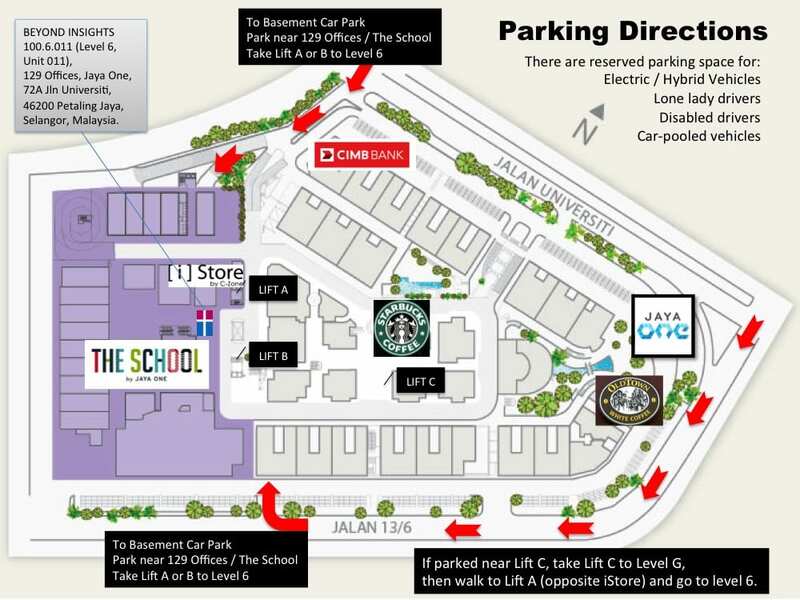 We recommend that you park at the basement car park of Jaya One for easy access and safety. There are 2 sides to enter the basement parking, Main Entrance via Jalan Universiti (by the side of CIMB Bank) and 2nd Entrance via Jalan 13/6 (by the side of Old Town White Coffee). This main entrance to basement parking near CIMB Bank is the best entrance to use if you want to park near Lift A or Lift B. Lift A or Lift B provides direct access to Level 6 of 129 Offices, which is where Beyond Insights is situated. To get to this entrance – go pass the Jaya One signage on Jalan Universiti and turn left at the entrance beside CIMB Bank (as shown in the picture) to enter the basement car park. Once you enter the car park, look for Lift Lobby A or Lift Lobby B, then park as near as you can. 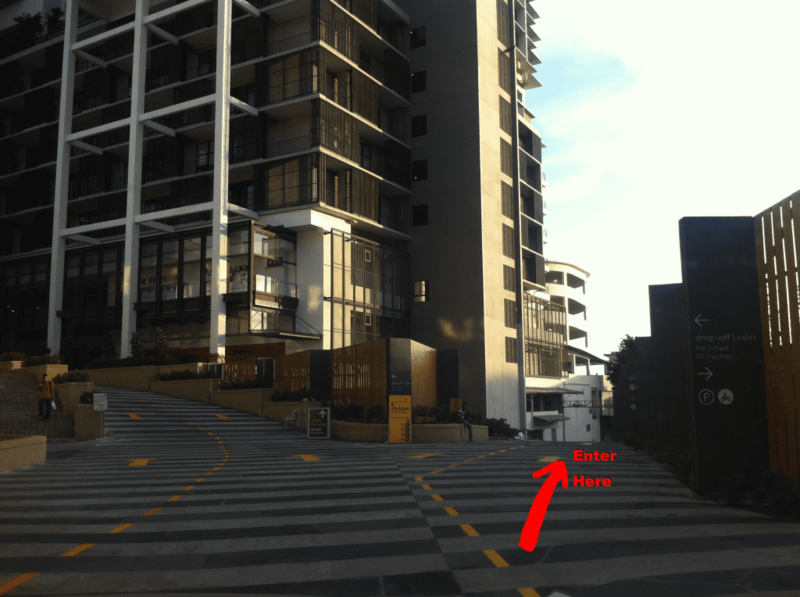 If you can enter through Lift Lobby A or Lift Lobby B – take the lift directly to Level 6. Alternatively, you can also park anywhere you can see the signage for The School. If you park near to Lift C – take the lift up to Ground Floor and you will exit the lift near Starbucks Coffee. Once you exit the lift, walk straight towards The School building. Right before main entrance of The School, you will see Lift Lobby A and B – take either one and go to Level 6. Phone: 603-79553636 Address: Jalan 17/47, Seksyen 17, 46400 Petaling Jaya, Selangor. Phone: 603 7610 2222 Address: No. 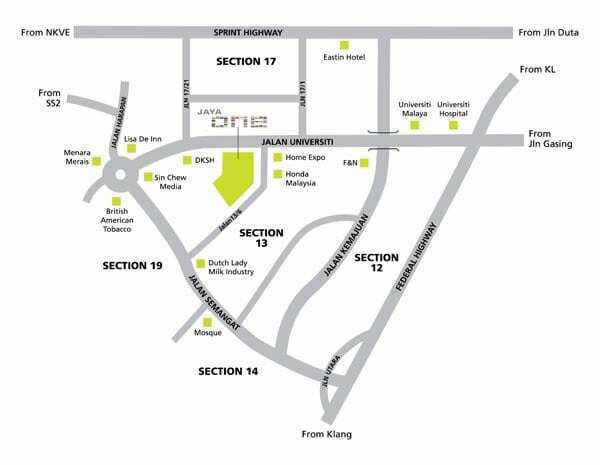 1, Jalan 13/1 Section 13, 46100 Petaling Jaya, Selangor. Phone: 603-79546888 Address: Lot 6, Lorong Utara C, Section 52, Darul Ehsan, 46200 Petaling Jaya, Selangor. Phone: 603-79584422 Address:12 Lorong Utara A, Off Jalan Utara, Petaling Jaya 46200, Selangor. Phone: 603-78759388 Address: 4 Jalan SS 2/61, Ss 2, 47300 Petaling Jaya, Selangor. Phone: 603-7865 6778 Address: 31 Jalan SS 2/75, Ss 2, 47300 Petaling Jaya, Selangor. Phone: 603-77109973 Address: 28 Jalan SS 2/61, Ss 2, 47300 Petaling Jaya, Selangor. Phone: 603-76651111 Address: 13, Jalan 16/11 Pusat Dagang Seksyen 16, 47300 Petaling Jaya, Selangor. Estimated price (per night for standard room): RM285. We can help you to book this hotel at our corporate rate, please check with us. Phone: 603-79559122 Address: Jalan Barat, 46200 Petaling Jaya, Selangor.